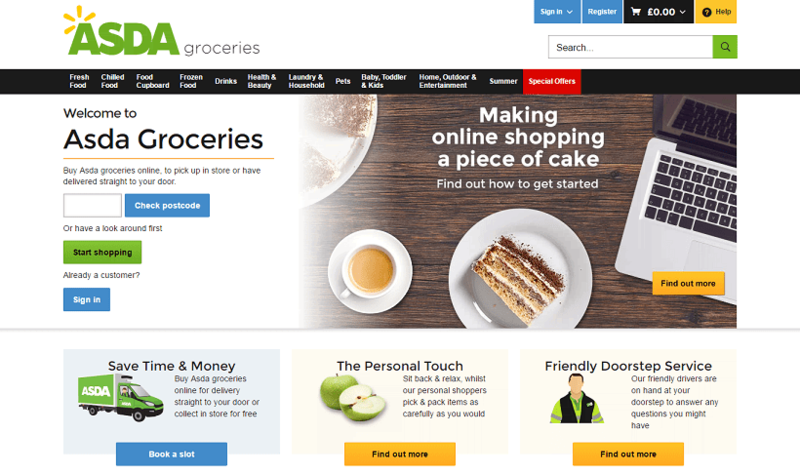 Sign up for free and just shop with Asda Groceries as normal. Our members earned £10,000+ at Asda Groceries in the past month. Customers who amend their order in any way will not be eligible for cashback. No longer give cashback on restricted items including alcohol and ASDA Price Guarantee. It is essential to test your tracking and ensure that you clear your cookies before purchasing as this could affect tracking. Always click directly from TopCashback. Asda Groceries cashback can be earned simply by clicking through to the merchant and shopping as normal. Asda Groceries Cashback is available through TopCashback on genuine, tracked transactions completed immediately and wholly online. Cashback will initially track at zero and be uplifted at a later date - this may take up to 6 weeks. Cashback may not be paid on orders if you have placed a previous online order (respective of when). Only ASDA Groceries purchases should be made through this link. For any other ASDA purchases, please visit George. Save on your weekly shopping with our Asda Groceries discount codes and cashback deals - just join TopCashback by completing the form at the bottom of this page. Fill your online basket with all the food & drink and household essentials you will need, including toiletries, laundry items and pet products. Then, once you have purchased your make-up, nappies, DVDs or light bulbs at great prices, you can choose to have them delivered to your home or collect them from your local store. Buy an Asda Delivery Pass to make great savings on delivery, while you can also take advantage of the Asda Price Guarantee, which means if they are not 10% cheaper on your comparable grocery shopping versus Morrisons, Sainsbury's, Tesco and Waitrose, they will give you the difference. As well as food & drink, their selection of health & beauty products features George cosmetics, dental care, pharmacy products, skincare and travel kits, while if you are in need of essentials for babies, toddlers and children, Asda Groceries offer baby food, nappies and toys. Their newsagent and entertainment store includes electricals, magazines, books and music, while you will also discover garden tools, kitchen appliances, bedding, towels, lighting and nursery furniture in their home & outdoor department. If you’re searching for savings on Asda Easter Eggs, then be sure to purchase through TopCashback and get money off. First time online Asda orders can take advantage of this cashback offer and pick up their big Easter shop for less. Last year’s Easter offers included a whole host of great low prices and deals. One of the best examples included the great for gifting, three for £10 on big brand Easter eggs from the likes of Cadbury, Mars, Nestle, Lindt and Thorntons. A great purse-friendly option was their range of smaller eggs, and for just £1, you could pick up big favourites such as Maltesers, Cadbury Creme Egg and Smarties, perfect for the kids Easter egg hunt. This year you can expect to see some of the same great Asda Easter egg offers as well as more savings on other lines to celebrate Easter with the likes of decorations, hot cross buns and all the ingredients for your Easter Sunday roast. If you’re looking for the biggest egg on offer, then you’ll find a selection of Giant Easter Eggs from Cadbury, while those looking for luxury can opt for the Asda Extra Special Easter Eggs that include Belgian chocolate and truffles. Those who are seeking out vegan and dairy-free options will find a great range at Asda too. With their Free From line-up, not only are the Easter eggs dairy free, but they also don’t include gluten or wheat. Purchase from Asda's full online range of groceries and collect your shopping in minutes with Click & Collect. Order by midday and you will be able to pick up your items after 4pm (subject to availability and excluding Sundays) by choosing your time slot and selecting your nearest local collection point. There is no need to worry about what condition your items will be in as they will take as much care picking the ripest bananas or freshest bakery goods as you would, while your food will be kept fresh, chilled or frozen until you collect it. You can collect for free at hundreds of locations at Asda supermarkets or petrol stations. Just arrive at your chosen collection point within your time slot and either pick your order up from the temperature-controlled lockers or wait for them to bring it to you. Purchase an Asda Delivery Pass and you will be able to enjoy as many home deliveries as you like from as little as £5 a month, as long as you spend a minimum of £40. What's more, you will not have to pay extra for peak-time slots. With their savings guarantee, if your delivery pass does not save you more than you would have spent on standard delivery charges, they will refund you the difference in the form of an eVoucher. You can opt for a 12-month anytime pass and either pay £5 per month or £60 up front, while you can pay £6 a month for a six-month pass or £36 up front. You are also able to buy a one-month anytime pass for £8 or a 12-month Tuesday-Thursday midweek pass for £24. You will be able to save up to £6 on every shop with a choice of peak-time delivery slots at no extra cost, meaning you can pick the most convenient time, be it early morning, evening or at a weekend. There is a 14-day cooling off period, which starts when you purchase your Delivery Pass, in which you can cancel it for a full refund, provided you have not yet used it. Once you have bought your preferred Delivery Pass, you can use it immediately when doing your Asda food shopping. You will be 10% better off when you use the Asda Price Guarantee. If your comparable online grocery shopping is not 10% cheaper versus Morrisons, Sainsbury's, Tesco and Waitrose, they will give you the difference - guaranteed - thanks to the Asda Price Guarantee, although you will need to have an Asda Groceries online Home Shopping account to claim your vouchers. Just buy online as normal, although you will need to purchase at least eight different items, of which at least one must be comparable. Then, visit the Asda Price Guarantee website to see what the comparable grocery shopping items would have cost you at the other supermarkets. If Asda were not 10% cheaper than the competitors mentioned on your comparable grocery shopping, they will give you a voucher for the difference. Claims must be made within 28 days, while there is a maximum limit of 10 claims and £100 worth of total claims per month. Fill your basket with all of your household essentials and earn great cashback rewards with these deals. Order food, drink and toiletries, as well as laundry, household and pet products, clothing for men, women and children, accessories and homewear, online from Asda Groceries and get them delivered to your home, or collect from your local store at a convenient time for you.